If there is one thing I have publically lamented the loss of more than anything else in Walt Disney World, it has been the Citrus Swirl (If there are two things it is Columbia Harbour House’s chicken tenders and upstairs kitchen. And yes, it does always come back to food!) First the Sunshine Tree Terrace lost orange concentrate and began using sherbet for its Swirls, and then it lost them all together to Aloha Isle down the lane. But rejoice, Citrus Swirl aficionados, I have found a way to concoct our own Swirls, though perhaps calling it a Citrus Swirl Deconstruction would be a more apt description! As I was making my way through the throng of guests pouring out of the Enchanted Tiki Room for the third time in a single day, I realized there was once again a crowd assembled around the Sunshine Tree Terrace, a sight as rare in recent years as a packed Tiki Room, and I decided to give the menu a once over. Remembering the good ole’ days when oranges ruled supreme under the Sunshine Tree, I ordered an Orange Slush. It was as close to the orange concentrate side of the Citrus Swirl as I had tasted in many years. To top it off, it even looked like a natural shade of orange, none of this glowing neon orange to hammer home the idea that you were partaking in something that was orange flavored. 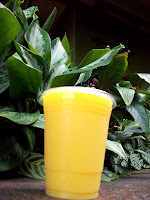 A few hours later the thought occurred to be that if you could pair this with vanilla soft serve, also available at the Sunshine Tree Terrace, you could reassemble your very own Citrus Swirl. My first attempt did not exactly yield the results I was looking for. That is, dunking a vanilla soft serve cone into an Orange Slush is not effective, and very messy. Pouring a bit of an Orange Slush into a cup of soft serve a little at a time is more functional, but still not perfect. In the end, I found that taking a spoonful of vanilla soft serve and then a gulp of Orange Slush yielded an almost perfect result. While you can never go home again, it was as close as stepping, or tasting, back into my childhood in the Magic Kingdom as I have been in many, many years. I miss the Citrus Swirl, I’m not afraid to admit it, and I know that I am not the only one. Memories are a wonderful thing to hold onto in the world of Walt Disney World because things are always changing, as they should be. However, when you can find a way to capture even a spoonful of those days gone by today, it can be a truly magical moment! Interesting concept worth a try.